Holiday season is pretty much here, and it’s time to get our delish ideas together to make it extra fun. Taking a few minutes now to make plans will help keep things stress-free later. Between hosting and holiday table hopping with the need to make a million dishes and desserts, having a few easy ideas that impress are a must. 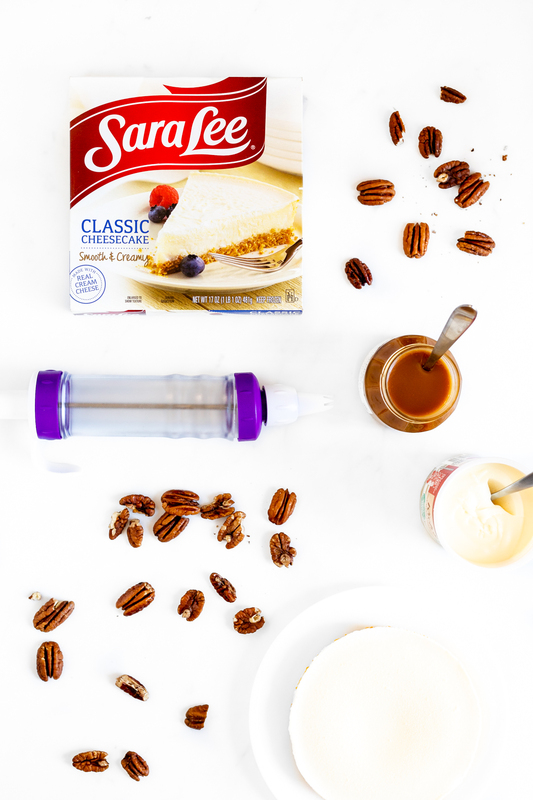 Today, I’m sharing 3 Easy Ways to Make a Holiday Cheesecake using Sara Lee® Frozen Cheesecake and Sara Lee® Frozen Strawberry Cheesecake available right at Target. Are you ready for some of the tastiest holiday hacks? These yummy and festive cheesecake ideas can be made in minutes and will be sure to put a smile on your guests’ faces. 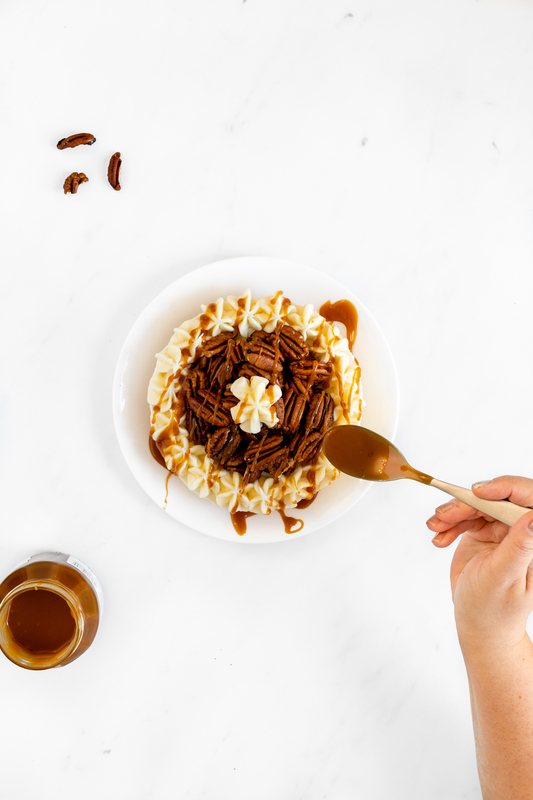 You can put your own, tasty twist on them to make these desserts your own and they’re so simple that the whole family can get involved. Nobody will have ever tasted anything quite like it, since you basically make it up! Using Sara Lee Frozen Cheesecake as the base or empty dessert canvas, you can get ready to have some fun. Taste testing is allowed, my friends. Let’s create! 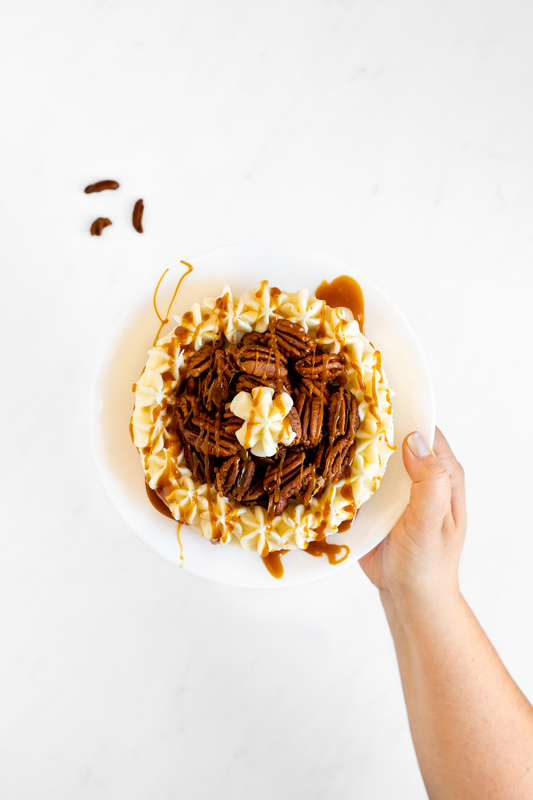 With a quick toasting of the pecans, and some extra thick store-bought caramel paired with cream cheese frosting, your eyes and taste buds are in for a treat. 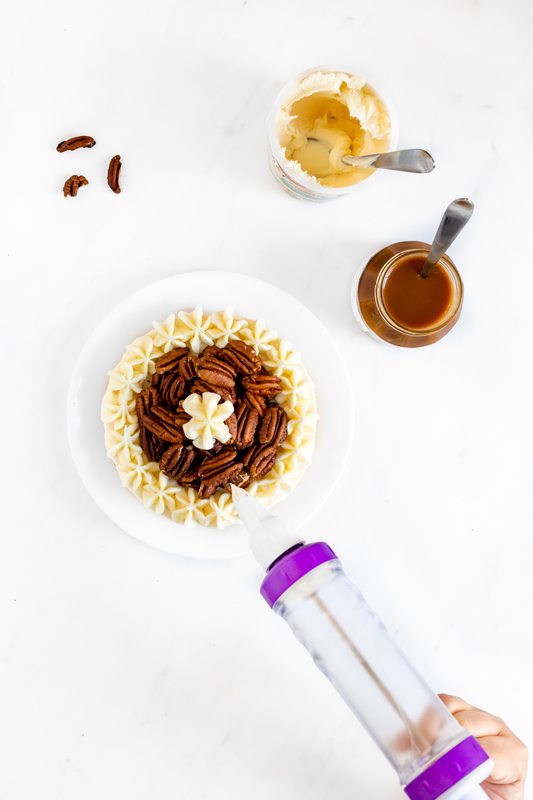 To toast your pecans, spray some non-stick spray on a baking sheet or parchment paper before spreading them out. Bake at 350 degrees Fahrenheit for 5-7 minutes or until desired toastiness is achieved. Let them cool briefly before assembling your delish creation. On your defrosted Sara Lee Frozen Cheesecake, use a star tip to pipe your cream cheese frosting around the entire cheesecake. Then carefully place your toasted pecans in the center, filling up the entire space. Then, add a final cream cheese frosting touch to the center of the cake. Lastly, drizzle the thick and glorious caramel over the entire cake evenly. Voila! You have a delish cheesecake that is quite perfect for any occasion or holiday table this fall. By the way, there’s a reason they call Sara Lee Frozen Cheesecake America’s favorite cheesecake! It’s delish! It has quality ingredients and is frozen fresh. Next up! Cheesecake that looks like a piece of candy! 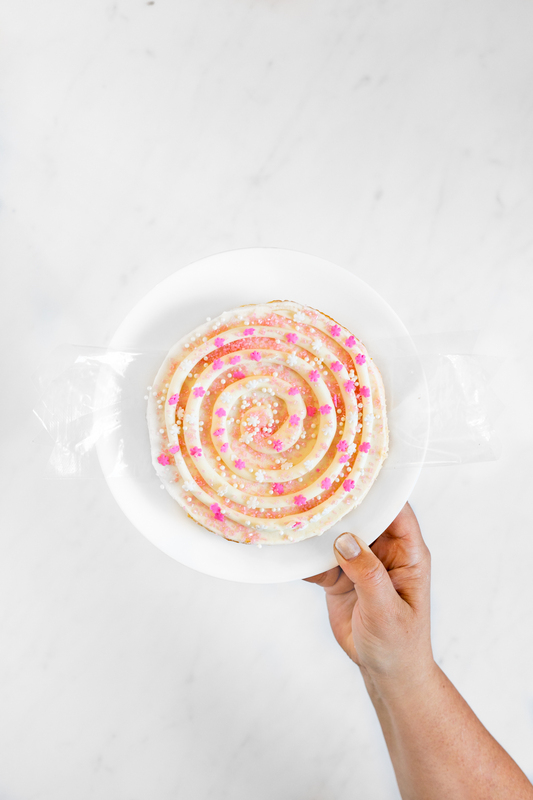 Starting from the center of the cake, make a swirl moving outward to cover the entire cake. Then, it’s sprinkle party time! 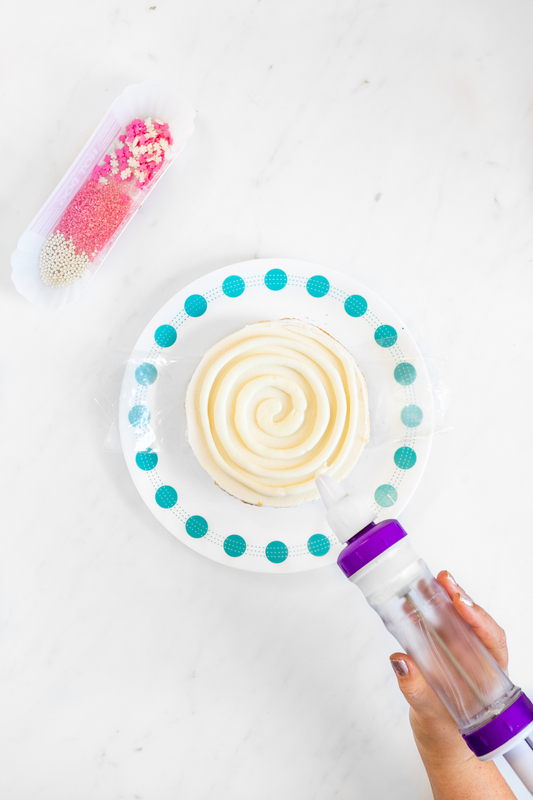 Using a mix of colors and varieties, sprinkle them through the entire cake! I love how this one came out! It would be fun to make a few in different colors for a gorgeous party spread! This last holiday hack is easy as… cake! Just add whipped cream in a pretty pattern around the cheesecake and add some mint to the center to really make it stand out! Voila! There you have it! Super easy holiday cheesecake ideas that take only minutes to make! 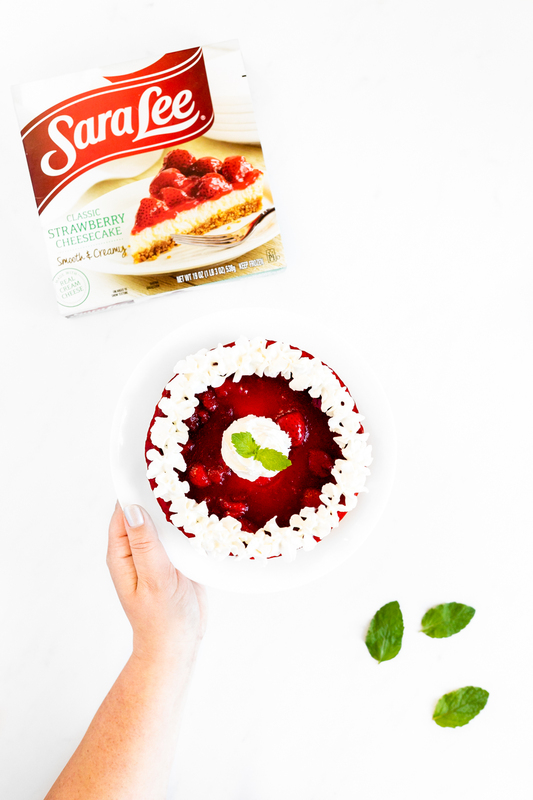 Make sure to shop your local Target to stock up on Sara Lee Frozen Cheesecake & Sara Lee Frozen Strawberry Cheesecake this holiday season!